Looking at this picture, "eco home" isn't exactly the first thing that springs to mind. 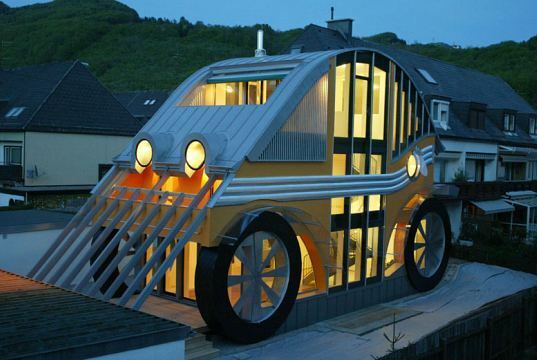 But it turns out this bizarre car-shaped home is surprisingly green. Dubbed the Auto Residence and designed by architect Markus Voglreiter, the house was built using a "3 liter" energy-efficient heating and insulation building system, which drastically reduces energy consumption. The facade, crazy looking as it is, is just for show. We wonder how his neighbors feel about it. Located in a traditional looking area of Salzburg, Austria and close to the borders of a nature preserve, Voglreiter’s Auto Residence sticks out like a Gremlin in a parking lot full of Mercedes sedans. Voglreiter had bought a traditional suburban 70’s house on a corner lot and wanted to redo it – what possessed him to make it look like a car is not quite clear. Amazingly enough, with his house located near the historic area of Salzburg, Voglreiter built the thing to code and got approval for it. The home features energy efficient heating and cooling and super tight insulation and shading, natural daylighting and ventilation all play a major role in the design, however unconventional. Another result of the remodel is separate dwelling areas for parents and children achieved by closing off former openings and thereby allowing many different generations to live under one roof. Located in a traditional looking area of Salzburg, Austria and close to the borders of a nature preserve, Voglreiter's Auto Residence sticks out like a Gremlin in a parking lot full of Mercedes sedans. Voglreiter had bought a traditional suburban 70's house on a corner lot and wanted to redo it - what possessed him to make it look like a car is not quite clear. 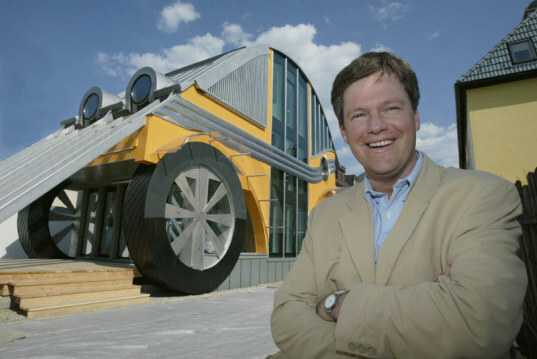 Amazingly enough, with his house located near the historic area of Salzburg, Voglreiter built the thing to code and got approval for it. he home features energy efficient heating and cooling and super tight insulation and shading, natural daylighting and ventilation all play a major role in the design, however unconventional. Another result of the remodel is separate dwelling areas for parents and children achieved by closing off former openings and thereby allowing many different generations to live under one roof.